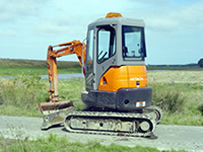 Wayne Henderson is a owner operator with two excavators in the Horowhenua district in New Zealand, specializing in foundation dig outs and drainage as well as general contracting. The ZAXIS35U represented good value for money. Wayne also spoke with other local Hitachi owners who were pleased with their machines and with the excellent service from CablePrice, the Hitachi dealer in New Zealand. Wayne finds the machine very comfortable and compact with good cabin layout, very easy to operate, smooth through all operations, and economical.